Aircraft Evacuation Market size valued at over USD 880 million in 2018 and is estimated to exhibit around 5% CAGR from 2019 to 2025. Increasing demand for emergency aircraft landing equipment due to risks associated with aircraft crashes are augmenting the aircraft evacuation market size till 2025. Proliferating demand from defense forces to develop technologically advanced and light weight evacuation systems, along with stringent government regulations associated with maintenance are further boosting the business share over the study timeframe. For instance, FAA and NTSB organizes periodic inspection for passenger safety equipment in aircrafts and provides multiple passenger safety training programs, thereby providing a positive outlook for the industry expansion. 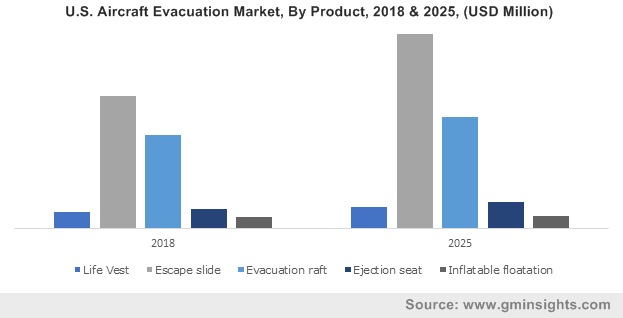 Technological advancements including the development of automatically inflated evacuation slides are positively influencing the aircraft evacuation market expansion till 2025. Additionally, advanced concept ejection seats offering multiple modes of ejection based on flight velocity and altitude are contributing significantly towards the industry proliferation over the study timeframe. Governments across the globe are mandating airline operators to equip safety technologies for enhancing passenger safety. For instance, in December 2015, Federal Aviation Administration (FAA) proposed the fixing of escape slides in more than 300 jetliners of the Boeing 767 aircrafts for improving passenger safety. The slides are equipped to prevent premature deployment and offer enhanced safety to passengers in case of any emergencies, providing growth prospects for the market expansion. Higher costs associated with the flight crew training and issues related to reliability of the aircraft evacuation systems may restrict the market place over the forecast timeframe. However, industry participants are developing lightweight solutions along with automated technologies for lowering the overall costs, thereby providing a positive outlook for the aircraft evacuation market proliferation. Increasing aircraft orders from multiple government organizations for improving their military are boosting the industry share till 2025. For instance, in April 2018, the Indian Air Force launched an ambitious program to purchase 110 military fighter jets on request for information (RFI) contract from global manufacturers including Lockheed Martin Corporation, Boeing, and Dassault Aviation, thereby providing significant growth prospects for the industry proliferation. Escape slide will register over 5% CAGR by 2025 owing to ongoing technological advancements including reduced inflation time and safer exit. Superior system durability and efficient operations to ensure passenger safety are providing a positive outlook for aircraft evacuation market growth. Life vest holds significant share in the market owing to stringent regulations for mandatory usage of floatation devices in air carriers. Evacuation raft accounts significant share in the market. This can be attributed to the modernization of fleet with upgradation and restoration activities of existing air carrier fleet for ensuring airworthiness. Increased seating capacity along with advancements in fabrics for evacuation rafts are among the key factors proliferating the market penetration over the forecast timeframe. Fixed wing dominates the aircraft evacuation market share owing to increasing demand for aircrafts across the globe. Aviation industry participants such as Airbus and Boeing are increasing production to meet previous backlogs. For instance, in 2017, Boeing announced to increase the production rate of 737 aircrafts from 42 to 52 in 2018. Moreover, increasing focus of aircraft manufacturers to equip maximum seats in the aircrafts with compact design along with rising adoption for low-cost carriers are further driving the segment growth till 2025. Rotary wing is expected to witness significant gains over the forecast period. Increasing military spending along with proliferating tourism sector are contributing towards the segment expansion over the study timeframe. Multiple advantages offered by these crafts including vertical landing and take-off operations, ability to maneuver in low speeds, and land in rough terrains are further strengthening the market share till 2025. OEM leads the aircraft evacuation market size with increasing investments by airliners for upgrading their product portfolio. For instance, in April 2018, EAM Worldwide entered into a strategic partnership with Lufthansa Technik and received the FAA TSO-C69C approval for manufacturing escape slides. Further, proliferating demand for cost-effective aircraft evacuation systems to facilitate low cost carriers are positively influencing the OEMs market share till 2025. Aftermarket will register around 6.5% CAGR in the aircraft evacuation market owing to the requirement for stringent maintenance to ensure accurate functioning. Industry participants are entering into long term agreements with airplane manufacturers for carrying out maintenance and repair requirements of emergency exit systems. For instance, in November 2016, Magnetic MRO entered into a long-term agreement with Air Astana for offering exclusive maintenance services for escape slides. Moreover, upgradation of escape slides after a specified flight cycle will further support in market growth over the study timeframe. North America aircraft evacuation market share was valued at around USD 330 million in 2018. This share is attributed to the presence of multiple aircraft manufacturers such as Boeing, United Technologies, Lockheed Martin, and General Dynamics Corporation. Increasing focus on lightweight evacuation systems and advanced technologies with ability to sense the ground and automatically adjust length are positively influencing the regional demand. Moreover, increasing aircraft production and delays associated with aircraft deliveries and backlogs are positively influencing the market expansion till 2025. Asia Pacific holds substantial share in the market owing to proliferating air traffic along with improving intra and inter region route connectivity across the region. Favorable demographic trends such as growing middle class population and rising discretionary spending are positively influencing the industry growth. For instance, according to the International Civil Aviation Organization (ICAO), Asia pacific is projected to witness annual air passenger traffic growth of around 6.5% by 2032. 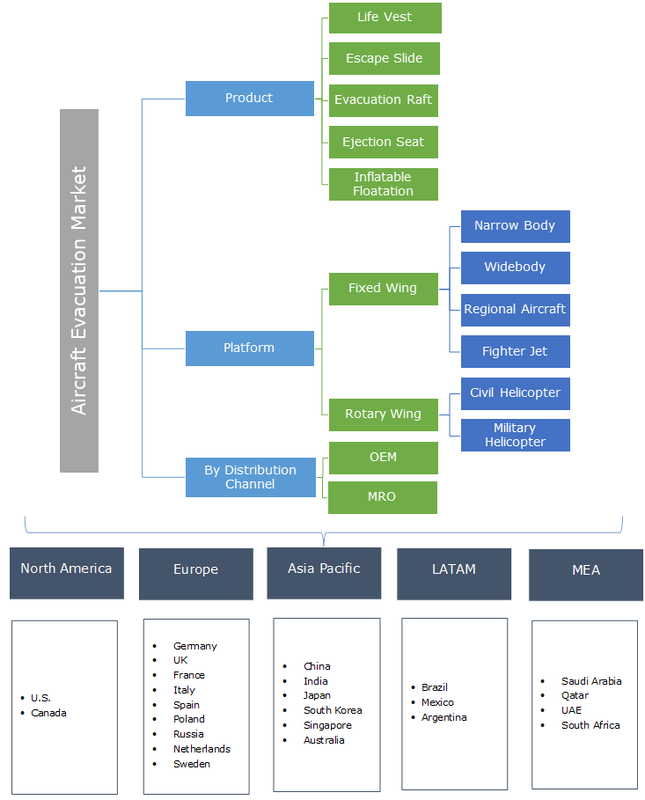 Key players in the aircraft evacuation market place include Zodiac Aerospace, EAM Worldwide, UTC Aerospace, NPP Zvezda, Martin Baker, Survitec Group, Switlik, Trelleborg, and DART Aerospace. Industry players are undergoing mergers and acquisitions to strengthen their foothold in the market. For instance, in October 2018, Safran signed a strategic agreement to acquire Zodiac Aerospace to enhance its production capacity and cater to larger consumer base. The market participants are focused on developing advanced technology for ejection seats to provide improved pilot protection. For instance, in July 2016, UTC Aerospace Systems unveiled its next generation ejection seat ACES 5 with the incorporation of advanced technology including sensor fusion, binocular 40-degree view, and active matrix liquid crystal display. This ejection seat restraints legs and arm from flailing and protects pilot heads from twisting. Technological advancements in the aircraft evacuation market such as utilization of advanced fabrics, automated inflated evacuation slides, and advancements in ejection seats such as upgraded parachute performance and smart rocket motors are providing a positive outlook for the industry growth. Seat functions are activated by recovery sequencing subsystem that includes recovery sensing unit and environmental sensing unit. Supervisory bodies including the FAA and the European Aviation Safety Agency (EASA) provide guidelines regarding installation of evacuation systems in air carriers.